Because you can't afford to lose it... Trust is the glue that holds an organization together. It turns deflection into transparency, suspicion into empowerment, and conflict into creativity. With it, a tiny company like John Deere grew into a worldwide leader. Without it, a giant corporation like Enron toppled. 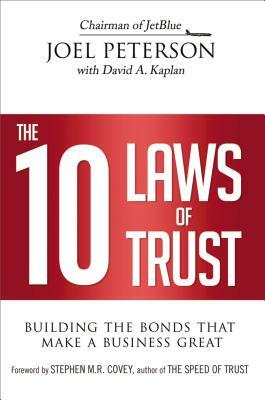 In The 10 Laws of Trust, JetBlue chairman Joel Peterson explores how a culture of trust gives companies an edge. Consider this: What does it feel like to work for a firm where leaders and colleagues trust one another? Freed from micromanagement and rivalry, every employee contributes his or her best. Risk taking and innovation become the norm. And, as Peterson notes, "When a company has a reputation for fair dealing, its costs drop: Trust cuts the time spent second-guessing and lawyering." In clear, engaging prose, highlighted by compelling examples, Peterson details how to establish and maintain a culture of trust. Steps include: Start with integrity * Invest in respect * Empower everyone * Require accountability * Create a winning vision * Keep everyone informed * Budget in line with expectations * Embrace conflict * Forget "you" to become an effective leader * And more With this book in hand, you'll be able to plant the seeds of trust-and reap the rewards of reputation, profits, and success. JOEL PETERSON is the Chairman of JetBlue and a consulting professor at the Stanford Graduate School of Business. Formerly the Managing Partner of Trammel Crow, one of the nation's leading real estate developers, he is chairman of the investment firm he founded in 1995. DAVID A. KAPLAN worked for 25 years at Newsweek and Fortune. A New York Times bestselling author, he is now a media consultant and teaches journalism and law at NYU.